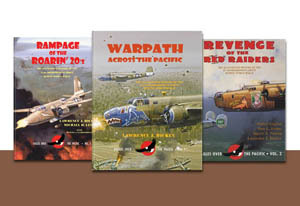 May 18, 1945 was an all too eventful day for the 65th Bomb Squadron, 43rd Bomb Group. Seven of its B-24s were sent to make up a third of a 21-plane raid with the 403rd and 64th Squadrons on Tainan Airdrome, located on Formosa (now Taiwan). Antiaircraft fire was heavy and accurate, and coming from both Tainan and the nearby Okayama Airdrome. Aircrews noticed two strange types of antiaircraft bursts. One looked like a gasoline fire bursting in midair, the other appeared to be a stream of fire trailed by smoke. As the crews made their runs, 1/Lt. James J. Franklin’s B-24 took a direct hit and exploded. All ten members of the crew as well as an observer were killed. To the right of Franklin was 1/Lt. 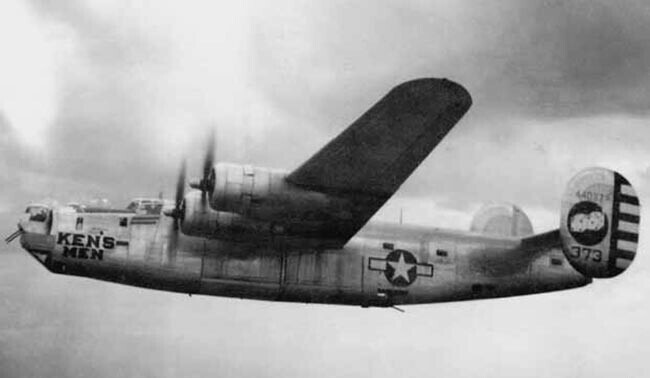 Rudolph J. Cherkauer in B-24 #373, which felt the brunt of the explosion and ended up leaving Tainan with two hundred new holes and three wounded men aboard. The bombardier was knocked unconscious by the blast. Both port engines were smoking heavily, but the #2 was still capable of running at reduced power. It was enough to get them to the emergency field at Lingayen, Luzon. The three wounded crewmen were brought to the hospital and eventually recovered. First Lieutenant Charles H. Wilt, another 65th Squadron pilot, finished his run and was hit in the #4 engine. To make matters worse, the #3 engine was running away and the smell of gas permeated the fuselage. Everyone on board knew they needed to bail out before their B-24 exploded, but they were warned against it by PBY crews standing by for rescues. By that point, Wilt’s B-24 was 6000 feet above rough seas with 25-foot waves, which would make it harder for rescue crews to find the downed airmen. Still, the crew felt like everyone would have a better chance of survival if the men bailed out. mortality into the light of hope. On this Memorial Day, we want to take some time to remember those who were killed in combat. Among them were several members of a B-26 crew from the 33rd Squadron. Their story is below. On January 7, 1943, 1/Lt. Leonard T. Nicholson and his crew were flying to Lae with a couple of other B-26s to target ships in the harbor. As the three planes began their bombing run, the Japanese began sending up antiaircraft fire to discourage the American crews. The men flew on and released their bombs. As they turned, YEAH! was hit by two blasts of flak, one of which knocked out the left engine and damaged the hydraulic lines. YEAH!’s bomb bay doors fell open, causing an unsustainable amount of of strain on the only working engine. 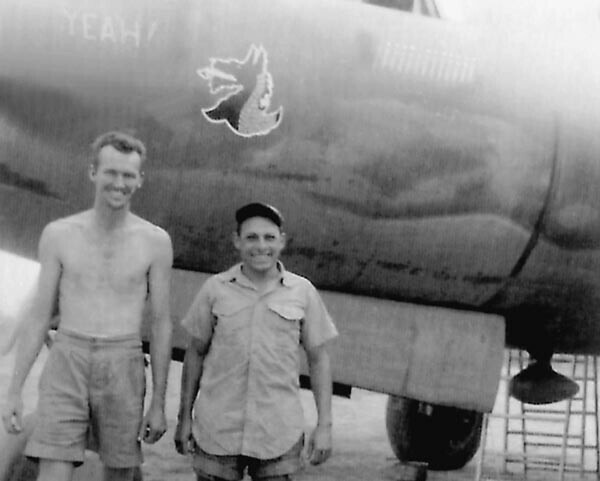 Two unidentified members of the ground crew stand beneath the Squadron insignia on the nose of YEAH! By this point, nine Zeros had caught up to the B-26s and the pilots knew it was time to get out of there. Nicholson knew there was no way he would make it back to Port Moresby on one overheating engine and let the crew know that they should prepare to ditch the plane. The pilot landed in Hercules Bay, located north of Buna, and the crew hurried to get out of YEAH! Engineer Sgt. Jack G. Mosely and radioman S/Sgt. Joseph P. Papp unfortunately did not escape and went down with the plane. The rest of the men swam to shore, helping the severely injured navigator Lt. Norm E. DeFreese along the way. Once on the beach, gunner Cpl. Thomas A. Moffitt went off to find help for his crew. DeFreese did not live through the night. The next day, three crewmen were walking towards Buna when they were spotted by Australian Beaufighters flying overhead. Food and a map were dropped to the men below. The relief that they must have felt was destroyed soon after by the sound of a gunshot. Bombardier S/Sgt. William M. Brown was killed by a Papuan Infantry Patrol that had mistaken the Americans for Japanese. The two remaining crewmen, the pilot and co-pilot, were separated during the chaos. Co-pilot Lt. Jack I. Childers spent a couple of unbearable nights fending off mosquitoes in the open air and three days looking for someone who would help him get back to base. On the second day, Beaufighters espied him once again and dropped supplies. Childers’ situation changed on the third day when he spotted natives on the far side of the river and was able to flag them down. They took him to their village, where he spent a more comfortable night, then was taken to an Australian camp the following day. He soon learned that both Moffitt and Nicholson were alive and had been flown back to camp within the last couple of days. Childers would soon follow them and rejoin the rest of his unit. This story can be found on p. 166 of our book Revenge of the Red Raiders. 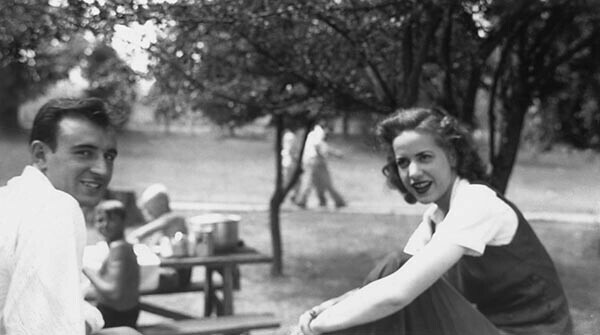 Over the last few years, we’ve shared a number of World War II stories with you. With Memorial Day coming up this Monday, we wanted to take a moment to remember everyone who lost their lives during the war and invite you to read some of their stories once more. HONI KUU OKOLE was shot down on May 21, 1943. The crew did not survive. The members of 1/Lt. James McGuire’s crew who did not survive their crash landing. The crew aboard the B-17 nicknamed KA-PUHIO-WELA, shot down during the Battle of the Bismarck Sea. Maj. Ralph Cheli and his crew, who were executed by the Japanese after being captured on August 18, 1943. As we observe Memorial Day on Monday, please take a moment to remember the men and women who paid the ultimate price during their military service. Here is one story where a crew from the 43rd Bomb Group joined those that we remember each year. Six B-17s were sent to bomb Vunakanau during the early morning hours of May 21, 1943. There was hardly any antiaircraft fire to evade and mission results were good: fires were seen scattered around the Vunakanau area as they left. Sadly, only four of the six B-17s made it back to base. One of the planes that didn’t return was HONI KUU OKOLE. As the pilot, Capt. Williams, was approaching the target area, a Japanese J1N1 Gekko “Irving” night fighter positioned itself underneath the bombers right wing. The fighter let loose with its 20mm cannon directly into the B-17s right wing. Both engines on the wing burst into flame and the pilot dove in hopes to escape the fighter. Bombardier M/Sgt. Gordon R. Manuel quickly salvoed their bombs as they left the area. When Williams leveled off at 6000 feet, the crew discovered that they hadn’t managed to shake the night fighter, which shot at the B-17 again. This time, both engines on the left wing were hit, putting the plane into a fatal dive. Soon, the fire spread to the waist section of the aircraft, getting close to the small incendiary bombs stacked on the floor. Crewmembers began preparing to bail out of the doomed aircraft. In total, three of the men were able to bail out of the plane before it crashed and exploded. Manuel opened the bomb bay doors and jumped through the open hatch. As he fell, from his vantage point of approximately 100-200 feet above the water, Manuel saw a second parachute, which he believed belonged to co-pilot 2/Lt. John S. Rippy. He landed about three-quarters of a mile away from Manuel. Sergeant Robert A. Curry, one of the waist gunners, bailed out and made it to shore, only to be captured by the Japanese and executed at Rabaul. When Manuel landed, he was about 300 yards from shore. It took him several hours to swim with one broken leg and the other leg filled with shrapnel. When he reached the shore, he buried himself in dead foliage to keep from being discovered by the Japanese patrols, then fell asleep for a couple of hours. Lt. Rippy was not so lucky. After Rippy swam to shore, he was discovered as he slept by Japanese soldiers, who took him onboard a destroyer and executed him. When he woke up, he began to walk along the beach, eventually meeting some natives that were working on a dirt road. Once he decided that there weren’t any Japanese among the natives, he stepped out from a hiding place and tried to communicate that he was injured. The leader of the village, Pagnkuf, was among the group and luckily for Manuel, he spoke some English. For eight months, Manuel stayed at different villages as he eluded the Japanese and recuperated from his injuries. During this time, he was also able to send natives on reconnaissance missions regarding Japanese positions and gun emplacements. This information would aid the Allies, and hopefully his rescue as well. It wasn’t until February 5, 1944 that Manuel finally left New Britain on the USS Gato. 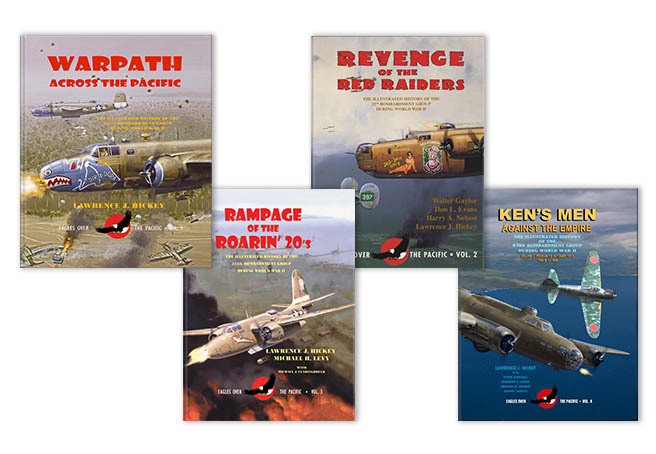 Additional details about this story can be found in Ken’s Men Against the Empire, Vol. I. Today we pause to honor those who have fallen in battle.